Our arrival at Ndutu in the Serengeti coincides with a scorching drought that sees the Ndutu Lake and its estuaries parched and dust hangs in the air wherever you move. There is a sense of anticipation that this remote wilderness holds some exciting adventures but none of us can anticipate just how exciting this will turn out to be. The wake-up call on day one is prompt and I jump out of bed smartly, its safari time and no sleeping in is tolerated here. It is still dark outside and the magic hour waits tantalisingly close. The bite in the early morning air warrants a short stint in the folds of my jacket as the wind funnels through the open top of the vehicle. We make our way down to the riverbed where we know the lions have taken up vigil at the only waterhole that now still has fresh water. 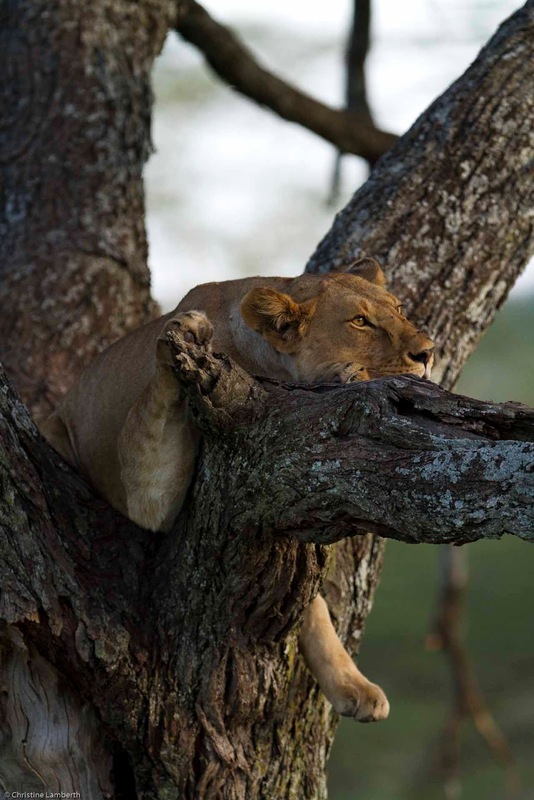 However, they are lazing around and we decide to head for the open plains where the cheetah roam. On day two the wake up process follows the same course and we head out in the same direction. 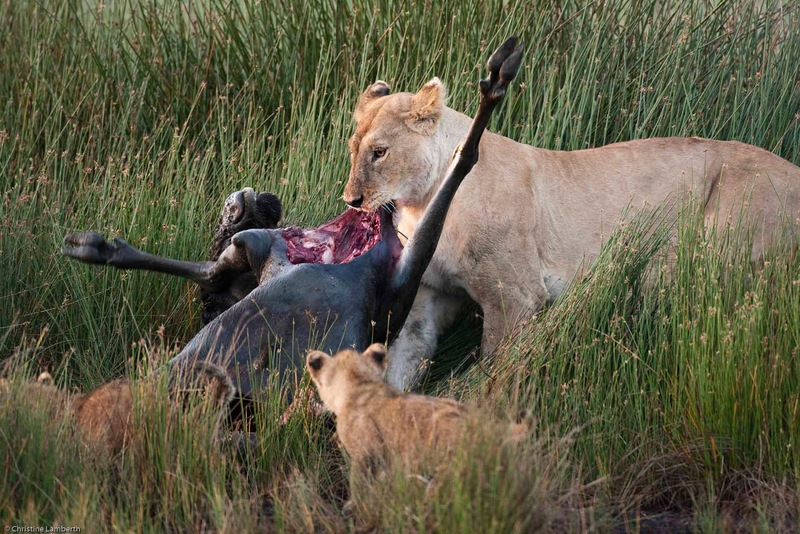 This time we find the lions have managed a kill during the night. 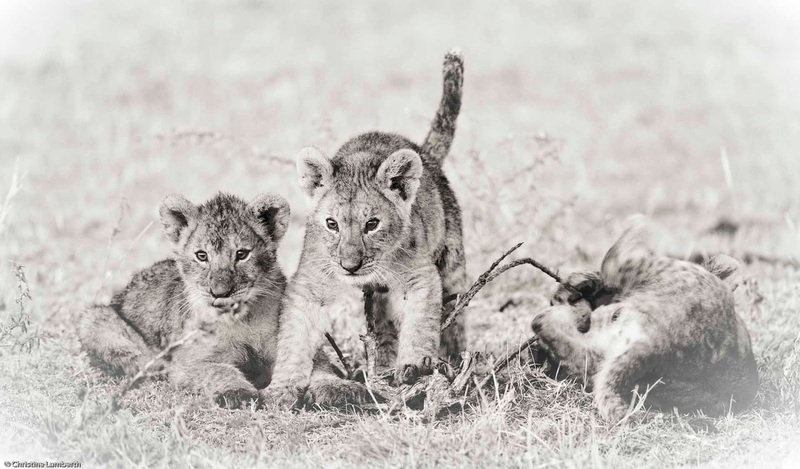 The cubs are out playing and in the early morning light we manage to snap a few shots of cubs and lions in that golden light that makes the effort of rising early well worth the while. 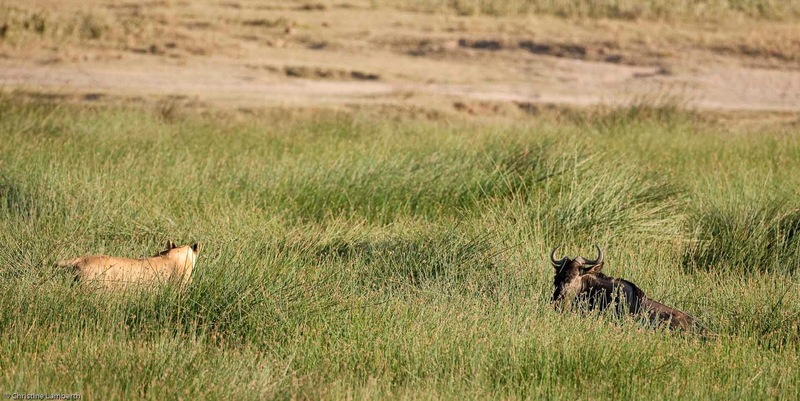 However, the “alpha” lioness is not playing ball and decides to drag her bagged wildebeest off into the reeds and we lose sight of the cubs and mom. Off in the distance one of the other lionesses decides to saunter on over to a herd of buffalo where she spies a young buffalo which it would seem she thinks she can separate from the herd. 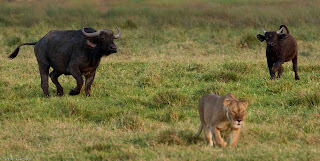 Cameras and lenses come out in anticipation but the ever present mother of the young buffalo emerges from the herd and we only see a lion chase in reverse. Still, very exciting. The sun takes its toll on all of us during the day and the afternoon break is spent flaked out on the bed lying very still in an effort to remain cool. As we head off to afternoon tea the sun is still relentlessly burning and we all sit listlessly in the tent wanting to go out but also not wanting to go out. Greg coaxes us out into the vehicles and we head off into the dust once again. 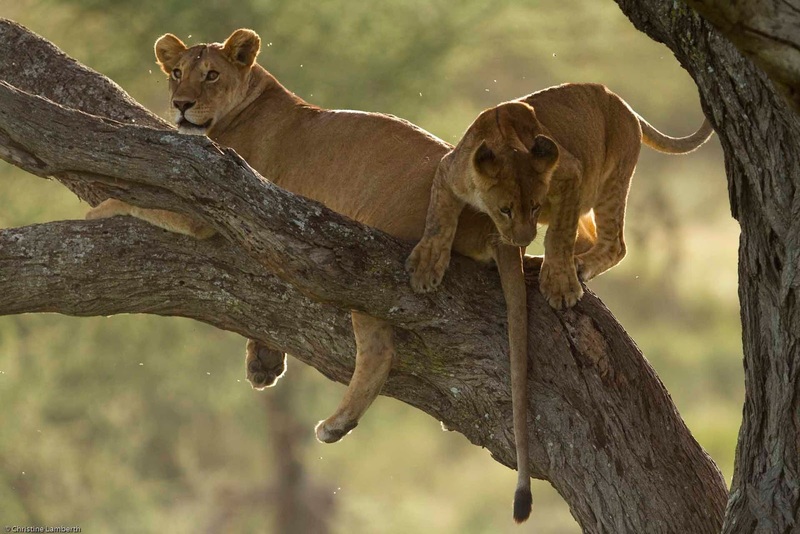 We decide to camp out on the bank of the river in a shade of a tree and wait to see if we get any action from the lions. They are predictably also lying in the shade of the trees sleeping. We move up next to two of the lionesses of the Ndutu Pride where they are sleeping and take some close up shots. We then find a suitable tree and wait. The inevitable fiddling with cameras takes place and we chat to each other casually about the heat and dust. I am standing in the back of the vehicle perched precariously on the seats with my camera resting on the beanbag. Suddenly there is a humming noise that sounds similar to a beehive on the move. As I am trying to identify the direction of the noise one of the lionesses sits up, takes one look and launches herself towards the waterhole. Then I see the source of the sound. It is a herd of wildebeest making their way down to the water. The echoing of their grunts is causing the hum in the air. 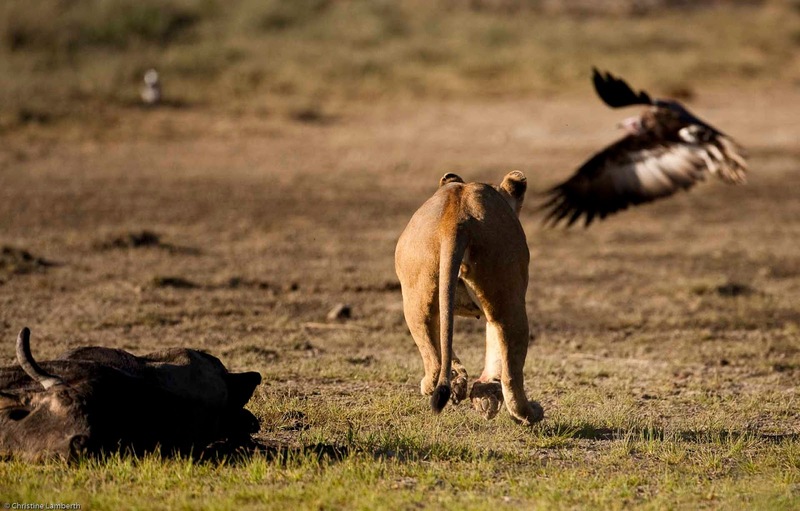 The lioness hardly even bothers to stalk the animals and runs headlong into the herd. Godwin is already in gear and we take off none too gently to look for a good spot to view the spectacle. The lioness hurtles off and separates one wildebeest cow and her calf in a small water pool. 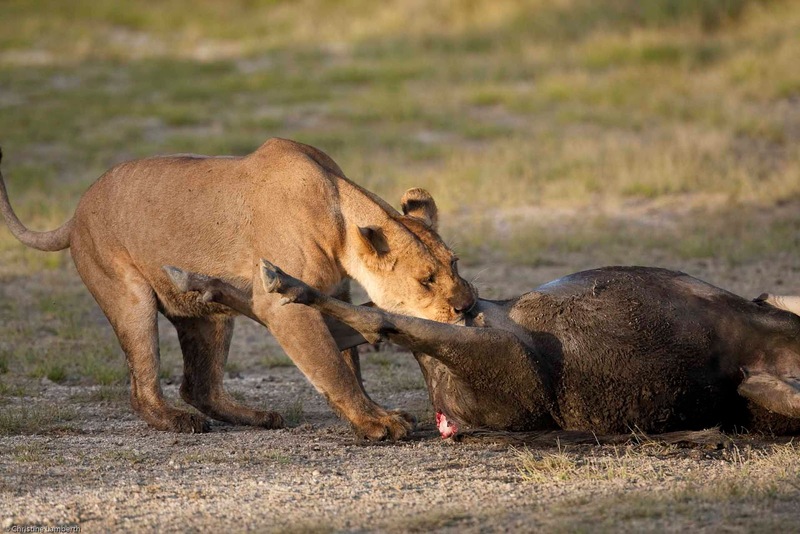 Then she efficiently launches herself at the calf and with one sharp bite she brings it down. Instantly she turns away and heads toward the mother of the calf standing uncertainly in the water pool. In a leap and a jump she is on top of the wildebeest and the life and death struggle plays itself out in front of the lens. In the meantime another of the lionesses has circled around and pushed another disorientated wildebeest into the reeds. 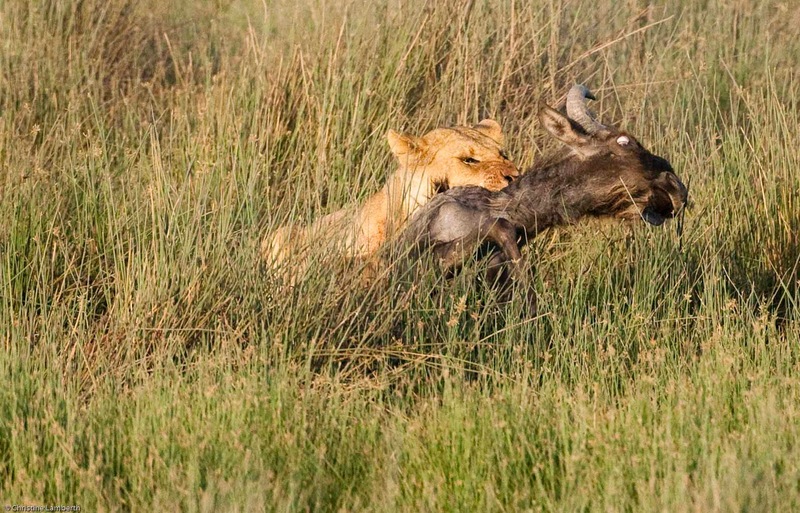 The wildebeest has to keep facing the lioness or she knows it’s all over. Within a few minutes the first wildebeest stops kicking and the lioness finally releases her vice grip on its throat. She sits up looking very self-satisfied and takes a look around. Her casual glance catches the movement in the middle of the reedbed and she sits and watches for a while. Then, as casual as can be, she saunters off into the reedbed and in a few quick movements helps the other lioness bring down the second wildebeest. This is jawdropping stuff. We watch transfixed as this killing machine efficiently provides for her pride. The lioness moves back to her own kill, she checks on the baby wildebeest and makes sure it’s dead and then settles down to her kill. 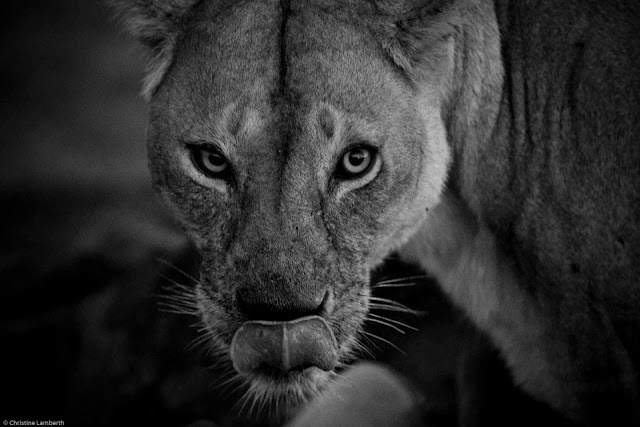 She starts pulling at the teats of the wildebeest releasing the milk and then slowly she laps up the milk. It is only once all the milk has been devoured that she then opens up the carcass and starts to feed. In my ignorance of the bush I am not sure if this is standard behaviour but I find it fascinatingly weird. The light starts fading and we still sit mezmerised by the scene below. Reluctantly we finally head back for camp. There is much discussion in the camp about the seeming overkill that we have witnessed but it is obvious that this is not an everyday occurrence and that as soon as the rains come and the wildebeest move on the lion pride will have much tougher days to deal with and hunger will once again become a driving force for a kill. The next morning the wake-up call gets me up promptly – this is exciting stuff. What will we see today? 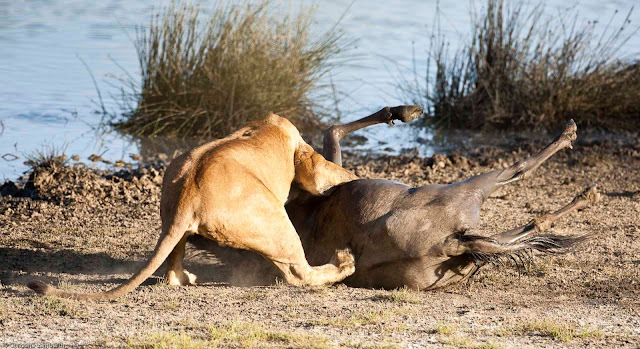 As we head off down to the waterhole where we left the lion pride last night there before us is another kill going down. Once again the mean machine has cornered a wildebeest in the reedbed and we witness yet another kill. This must certainly count as being the most exciting safari I have ever been on. The action is non-stop and around every corner there is something else to see and it is not sitting in a tree or lying under a bush – it will be moving and we have to be alert to catch the action. Adrenaline pumping stuff! The following morning we are sadly heading away from Ndutu. 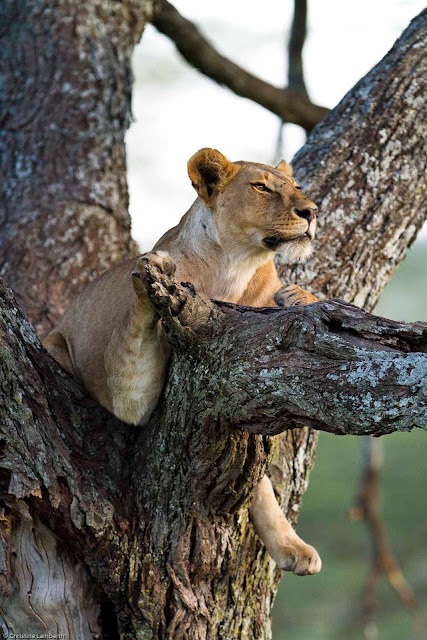 We pack our bags and the plan is to leave early so that we can get to the Serengeti National Park for a good long game drive in the afternoon. Our plans are however thwarted by communications that are not working. We decide to head off down to the waterhole again while we wait. We are early and as we approach the bend in the river before us is a scene that is literally mindbending. 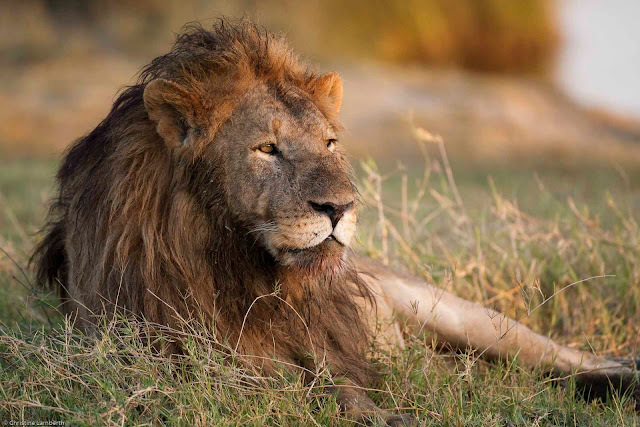 The lions have killed yet another two animals. A wildebeest and a zebra lie on the embankment and as we settle in for a vulture photo shoot that still has me smiling our mean machine is stalking some more wildebeest off in the distance. However, some vehicles get in the way and she is thwarted from a third kill for the morning. Finally we are on our way. The heat and the dust are ever present and the lack of ice and cold water is now really getting to me. The Serengeti National Park is reminiscent of the Highveld of South Africa and our stop for lunch is on top of a huge boulder where we have a view that stretches out into forever. We finally make it to Sopa Lodge where a cold shower and ice and cold drinks make me feel I have just won the lottery. Can ice really be delicious? The afternoon game drive starts with a dusty drive down a dusty track and then the tstetse flies make their presence known. We spend some time swatting and beating flies inamongst much cursing and laughing. Suddenly we veer off to the left and the flies are left behind. We have not driven far when we come across three lionesses and a young cub resting in the trees. What a sight. While we are photographing this rare sighting a massive bull elephant decides that he doesn’t really like these two vehicles or the click click of the camera shutter. Ears flapping he approaches the vehicle and then stands and stomps his huge foot in the dust. I stand transfixed holding onto my camera and not breathing. After what seems an eternity he decides we are not worth the trouble and moves off. Great sighs of relief!! This is a perfect end to the perfect safari. I reluctantly am leaving this bit of paradise with the knowledge that I will be back many more times. The call of Africa has me thoroughly in its grip. NDUTU – THE REAL SERENGETI?